Start with a pie crust – I’m going with a traditional lard pie crust. (Note the pie crust recipe makes a lot – you might want to make half). Roll out the pastry, and grease a pie pan, or a cake pan, or whatever pie vessel you want. Put the pastry in, flute the top – crimping between two fingers with your thumb, or not, I am not judging. 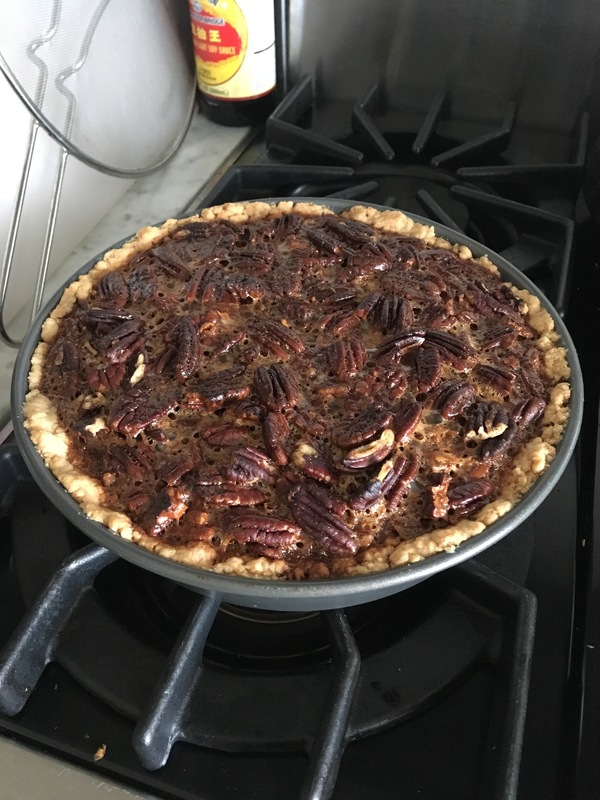 I made this pie recently, in a cake pan, and didn’t crimp it – but made it a super deep pecan pie – which was pretty awesome. Pre-heat the oven to 350° F. Put a sheet pan on the rack below where you’re going to put the pie, they tend to overflow. Put the prepared pie crust in a the freezer. Melt the butter, add the brown sugar. Whisk till it melts. Add the honey, and cook a little longer. Slowly add the hot sugar mixture. Add a layer of pecans to the pie crust. Pour in the sugar, and keep adding pecans until all of them are in. Bake for 50 minutes, to an hour. Check it at 45, and if the crust is getting to dark, cover the edges with foil. Serve with whipped cream, or ice cream, or whiskey.